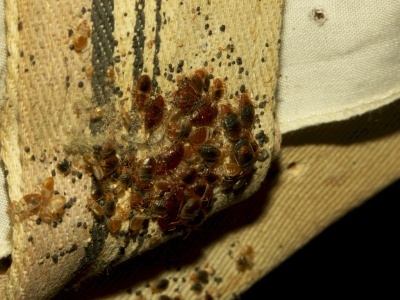 Bed bugs are primarily nocturnal insects that feed exclusively on blood. Adult females can lay 1-5 eggs per day. Eggs hatch approximately 7-10 days after being deposited by the female. Development from egg hatch to adult takes approximately 1 ½ -2 months but can take longer depending upon environmental conditions and food availability. Surprisingly, individual bed bugs do not seek a blood meal everyday and may go several days to a week (or more) between each blood meal. 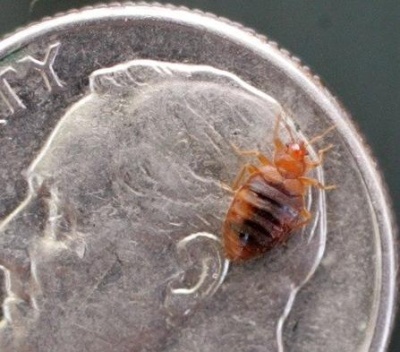 Bed bugs are believed to be mostly inactive between blood meals, harboring in their secretive resting places. Bed bugs are not limited to the bed or the bedroom but instead will disperse throughout a structure. Bed bugs are very resilient and can easily survive for several months or more without a blood meal. Bed bugs belong to the family of insects known as Cimicidae. All members of this family of insects feed exclusively on blood which they require in order to develop and reproduce. There are a number of closely related species in this family that feed on birds, bats and other animals. However, the species most adapted to living with humans is the common bed bug, Cimex lectularius, which is found world wide. The immature bugs go through five developmental stages before reaching maturity. A blood meal is required between each stage. As the immature bed bugs develop they continue to become larger and darker until reaching adulthood. Under favorable conditions (70-90°F), bed bugs can complete development (from egg to adult) in one and half – two months. Cool temperatures or limited access to a blood meal may extend the developmental period. Adults will typically live for just under a year. The adult females typically deposit up to 5 eggs per day depositing them in a wide variety of locations, both on and away from the bed. An adult female may lay up to 500 eggs during her lifetime. Bed bugs are nocturnal insects and lead a very cryptic lifestyle. As a result, bed bugs are often present for weeks or even months before a single bug is ever seen by the occupants of an infested structure. They live in cracks and crevices associated with bed frames, head boards, mattresses and box springs. However they also will disperse away from the bed and can live between or beneath floorboards, carpeting, under decorative moldings, in or under furniture, behind picture frames, inside wall voids, etc. There is virtually no crack too small for this insect to occupy. It is from these secluded cracks and crevices that the bugs emerge during the night-time hours to feed on their sleeping host. The bites are typically painless and often go undetected. Bed bugs differ from many other blood feeding pests such as mosquitoes, fleas, etc. in that both adult males and females, as well as all of the immature stages, feed on blood. Once they have fed they return back to their hidden resting places. In the absence of a host, bed bugs can continue to survive for many months without a blood meal. 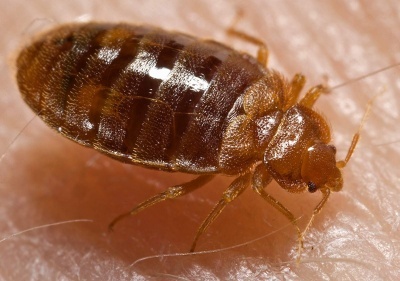 In fact it has been reported that in some cases bed bugs can survive 18 months or more without feeding.